On October 17th, 2016, the Pittsburgh Penguins fell to the Colorado Avalanche in a 4-3 overtime decision. 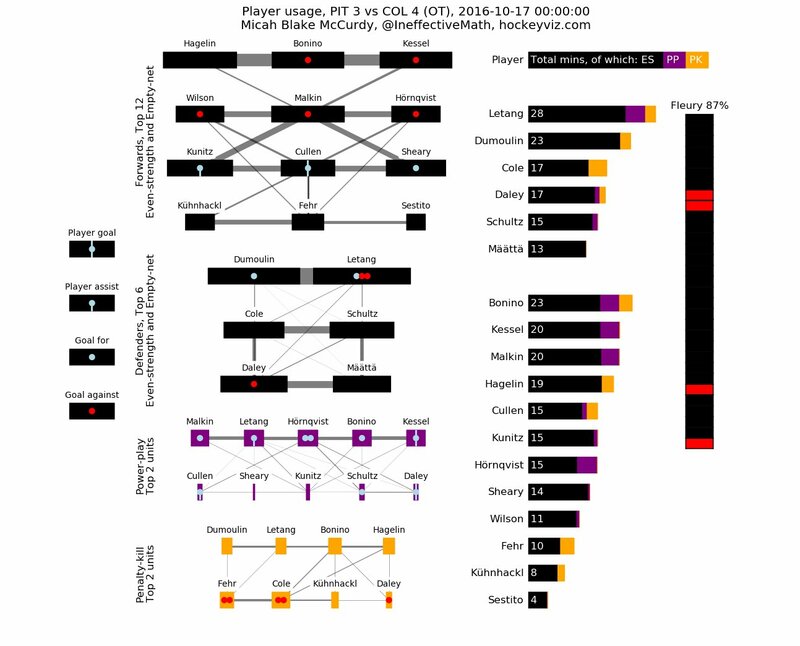 Thanks to Micah McCurdy (@IneffectiveMath), we can see how the Pens individually did in the game. When looking at this, there is one number that disturbingly sticks out from a small area: 4. Four, the number of minutes Tom Sestito played during this hockey game. Before we progress any further with Tom Sestito, I'd like to look back to last season's fourth line: the combination of Eric Fehr, Tom Kuhnhackl, and Matt Cullen. Looking at how much time on ice (TOI) they averaged at even strength, per game, I found the following: Eric Fehr, 10:13 in the regular season, 9:45 in the postseason; Matt Cullen, 11:06 in the regular season, 11:40 in the postseason; Tom Kuhnhackl, 11:11 in the regular season, 9:59 in the postseason. Those are all reasonably close to each other, and became the consistent fourth line for the Pittsburgh Penguins once Kuhnhackl cemented his place in the lineup. For an active fourth line that can produce (and is trusted by the coach), this is a normal thing to see. According to Corsica (corsica.hockey), the trio had 189.68 5-on-5 minutes together last season (regular season & postseason combined.) They also had a CF% of 52.69 after score, zone and venue adjustments. To quote Micah McCurdy, "they were monstrously good in the playoffs." So, considering all of this, we will say that the combination of Eric Fehr, Tom Kuhnhackl and Matt Cullen is the standard for a fourth line in Pittsburgh. 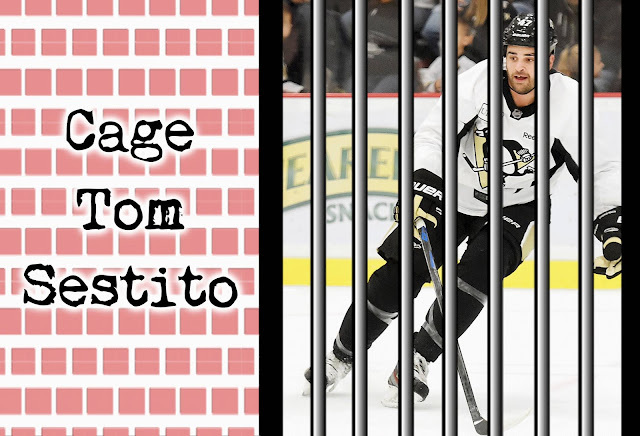 Now, let's come back to Tom Sestito. Last season, he averaged 5:48 TOI per game in the regular season (he was never utilized in special teams situations, nor did he play in the postseason.) Considering his shifts averaged about 41 seconds per shift, this means Sestito averaged about 8.5 shifts per game last year. During the regular season alone, Fehr averaged 20.6 shifts per game, Kuhnhackl averaged 19.3 shifts per game, and Cullen averaged 21.4 shifts per game. Apparently, the reason the Pens are using a spot in the lineup for somebody to play a few minutes per game (which makes everyone else play more minutes, perhaps fatiguing them more than is necessary), is so Sestito provides a somewhat protective presence in the lineup. Protecting the star players from cheap shots, as it were. Well, let's take a trip back to the Pens-Caps game on October 13th, 2016. At 6:33 of the 1st period, Tom Kuhnhackl ran into Braden Holtby as they were both attempting to get the puck, and Kuhnhackl received a two minute minor for roughing. Following it, there was some rough stuff. After this, at 8:54 of the 1st period, it was the battle of the Toms as Wilson and Sestito were both assessed 5-minute majors for fighting. So, following the previously mentioned notion, this fight should warn the Capitals lineup that if they take cheap shots at Pittsburgh's star players, there will be consequences. Right? Well, this happened at 19:56 of the 2nd period. So, dare I ask: Wasn't Sestito's presence supposed to prevent this kind of thing? Well, whether it was or wasn't, the flat out reality is that it didn't. And how much did Sestito play in this game? What is the point, if not to protect our stars? Even if that is the point, it's very obvious that it isn't working. He isn't intimidating anyone. So...what should the Penguins do with Sestito? I'm not Jim Rutherford, but I believe they should send him down to the AHL. For a variety of reasons. First off, let's remain in the hypothetical that Bryan Rust and Sidney Crosby are still hurt (or we can operate under the idea that Conor Sheary will be out for at least a few games, as he was hurt in the game against Montreal on Tuesday, October 18th. He is day-to-day with an eye injury. Sidney Crosby is still not practicing.) Instead of giving Tom Sestito the 12th forward spot, why not somebody else? Like, say, two players from the Wilkes-Barre/Scranton Penguins. Before I get into these two players, I want to say that I believe the Wilkes-Barre/Scranton Penguins can benefit from Tom Sestito's presence more than the Pittsburgh Penguins will. In the AHL, Sestito is much more productive in terms of offense, which is generally what you want from a forward player. This is evident in his point production, alone. In 41 regular season games, Sestito managed to get 5 goals and 9 assists for 14 points. In 7 Calder Cup Playoff games, Sestito potted 1 goal and notched 3 assists for 4 points. That isn't bad for a bottom six AHL forward, by any means. So I believe the Baby Pens could stand to benefit having him in the lineup more than the Pens could. Now, for replacement options, I have two ideas. Firstly, Jake Guentzel. Or as I like to call him, Blonde Superman™. Guentzel was among the last roster cuts from the Pens training camp, and although he was held pointless through the pre-season, the 2013 third round pick performed unbelievably, as he received many ringing endorsements from coaching staff. In his first AHL season, in 11 games, Guentzel notched 2 goals and 4 assists for 6 points. It was in the postseason, however, where the blonde superman exploded. In a mere 10 games, Guentzel had 5 goals and 9 assists for 14 points. The Baby Pens didn't make it passed the 2nd round, but Guentzel still ended up leading all AHL rookies in postseason scoring. Oh, and on opening night for the 2016-17 AHL season? Just a four point night for Jake Guentzel, including this highlight reel goal. 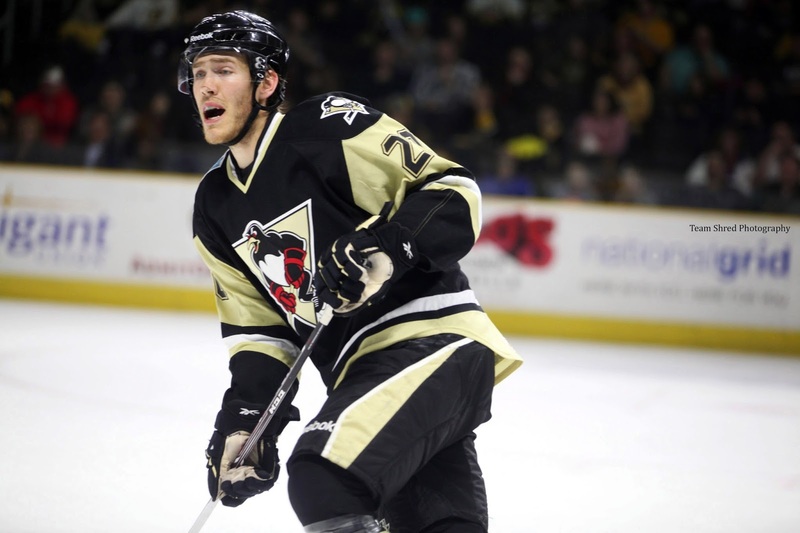 Another option is Carter Rowney. In the 2015-16 AHL season, Rowney scored 24 goals and 32 assists for 56 points, over a 74 game span. In the postseason, Rowney 4 goals and 8 assists for 12 points, over a 10 game span. As a result, Rowney was signed to his first career NHL contract by the Pittsburgh Penguins and, like Jake Guentzel, was among the last roster cuts. On opening night of the 2016-17 season, Rowney was also productive with a goal and an assist. Now, the argument could be made that putting one of these two in Sestito's position would have them "wasting away" on the Pens' fourth line. Now, see, if this was a discussion a few years ago, I'd agree. But no longer is that a valid claim. As previously mentioned, the standard for Pittsburgh's fourth line is skilled players like Matt Cullen, Eric Fehr and Tom Kuhnhackl who all manage to get at least 10 minutes in at even strength, per game, and a healthy amount of shifts per game. 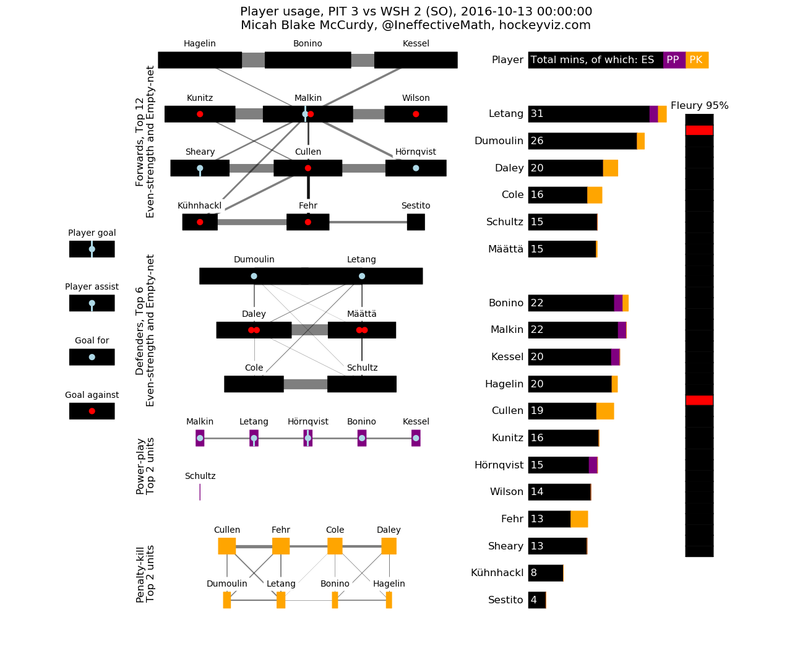 Getting somewhat-sheltered NHL time with the likes of Fehr, Cullen or Kuhnhackl (depending on how Sullivan would structure the lines) could not only be beneficial to the careers of Guentzel and Rowney (specifically Guentzel's development into what could potentially be an eventual full-time NHL player), but beneficial to the Pens as well. One of these two being put into the lineup is yet another scoring threat for the Pens. And not a player who will play for four minutes, not serve the purpose they're apparently supposed to, and make everyone else play more as a result.